Welcome home to this pristine, three-bedroom, three bath furnished corporate rental, poised in centrally located Bernal Heights, for an easy commute to all points in San Francisco. 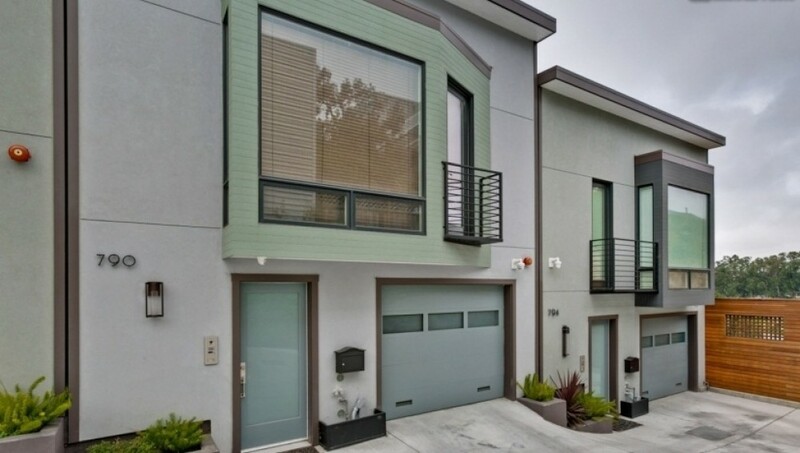 This brand new home is less than five minutes from Highway 101 and 280, but a car is optional as the MUNI can take you to the Glen Park BART station, which is also only five minutes away. Easily visit the Golden Gate Bridge, Pier 39, the Embarcadero district, the Walt Disney Family Museum, ride a cable car, have some famous clam chowder... San Francisco is your playground. Some of the USA’s best known companies are fifteen minutes or less from this corporate rental. Just the Fortune 500 companies headquartered here are Kaiser Permanente, YouTube, Wells Fargo Bank, Safeway, PG&E, Genentech, Oracle, Chevron, California Pacific Medical Center, and Gap. There are world class learning institutions too: UC Berkeley, UC San Francisco, and Stanford are all close at hand. This large townhome offers you almost two thousand square feet to stretch out. A gray-green palette extends from the exterior to the interior of this gorgeous home. Modern, tasteful decorating is illuminated under recessed bulkhead ceilings by spotlights and drop pendants. Maple hardwood flooring throughout is softened by throw rugs in the living room and bedrooms. Entry brings you to the lower level’s great room. First to welcome you is a kitchen that could easily be the set of a cooking show. A massive center island with dishwasher, double sink and pull-down arc faucet demarcates the space. Pendant lighting and three barstools border the island. A six-burner stainless steel gas range, an inset stainless steel refrigerator and double range all from Thermador are here. You may have more fun preparing dinner than eating it, but a beautiful six-seat hardwood dining room table won’t disappoint. A leather recliner and two seat sofa mark an elegant living room space framing a walnut coffee table and both a massive gas fireplace and LCD smart TV. Also on this level, an office-bedroom features a Simmons Beautyrest luxury queen mattress with Pacific Coast down duvet and four down pillows accompanied by a designer NPD low back office chair and desk workstation. Upstairs, a second bedroom decorated in orange and teal offers a handmade queen Aireloom mattress enshrouded by a Pacific Coast down duvet and four down pillows. Read a good book in the adjoining birch armchair, or admire the garden and the sunrise from the balcony while you take in the fresh air. A corridor bathroom with walk in shower serves this bedroom. The master suite?is appointed with two Simmons Beautyrest full size mattresses with Pacific Coast down duvets and four down pillows. A full-sized walk-in closet is at your service here. The en-suite bathroom has a luxurious double rainfall shower and vanity. Across the room, the balcony door provides you access to the garden and a city view. Cable and Wi-Fi are provided, and a washer and dryer will make your laundry chores easy. Bernal Heights has an urban village feel with tea shops, restaurants, coffee shops, groceries, library nearby. It is south of the Mission and 10 minutes by freeway from downtown. Conveniently located between downtown and Silicon Valley, I would say the place is set in the middle of things. Closeby are three parks, St. Mary's, Holly Park, and Bernal Heights Park, where there are playgrounds, tennis courts, and a spectacular view of the city at Bernal Heights Park. It is close to St. Luke's hospital and not too far from UCSF. The Bart station can be accessed by taking the #23 Bus to the station. No Smoking. Remove shoes inside the house. Do not move the furniture around. No noise after 11 pm as there are others that will be affected. Allow housekeepers access during cleaning days. Lights should be turned off when leaving the house. Lock front door upon exit. Families, executives, traveling nurses, workers on temporary assignments. Beautiful Bernal Park is just minutes away. Also Holly Park is close buy. Cortland Avenue is a hub of activity with its stores and coffee shops. Mission district is very close by. Easy access to the 280 and 101 freeway which means it is just 15-20 minutes to the downtown area. It is located 20 minutes from the SFO airport. A muni bus #23 takes you to the Bart station where you can ride to downtown. At Cortland there are buses that will take you downtown San Francisco. $295 move in move out cleaning fee. Maid service available upon request for an additional fee of $150 per visit. Remove shoes in the unit.